The prospects that the National Football League might return to Southern California seemed to ratchet up a notch Wednesday after the city of Oakland announced that it would not meet the deadline set by the league for a stadium financing plan to be submitted, increasing the possibility that the team could return to the Los Angeles area. While a formal plan was not submitted to the league, it’s expected that negotiations will continue with the Raiders’ front office. However, preliminary negotiations have been characterized as “not serious” by the team’s owner, Mark Davis. The December 30 cut off date was imposed by the league’s commissioner, Roger Goodell, in part to offer time for review before the 32 owners meet in Houston January 12-13, where a possible vote on the dueling stadium plans in Inglewood and Carson could take place. In a statement released today, Congresswoman Janice Hahn, whose district includes the proposed stadium site in Carson, called on NFL owners to bring the Raiders back to the Los Angeles area, a town they deserted when it moved back to Oakland in 1994. Those open arms include the city already renaming a street near the proposed site “Stadium Way,” and the city approving a building moratorium earlier this month for the property surrounding the site. Hahn said this kind of support displayed by Carson Mayor Albert Robles and the city council have shown that the city will be an energetic partner for the NFL, and it’s now up to the owners to show the same level of interest. Admittedly, Hahn said she’s a cheerleader for the Carson proposal because it lies in her district, but said she’s just a fan of bringing the NFL back to LA. During her time on the Los Angeles City Council, she supported the idea of bringing expansion teams to the area when there was less interest from established franchises. Hahn estimated that having one team could support 7,000 jobs, and two teams could up that number to around 13,000 annual jobs. Those numbers don’t take into account the stimulus to the construction industry that would be charged with erecting the facility. 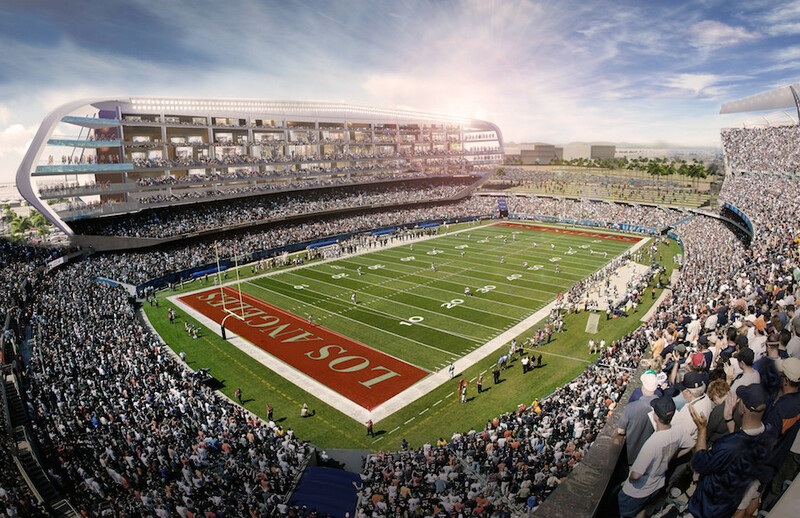 The possible impacts of a stadium being built in Carson was visited by Mayor Robert Garcia in a letter he addressed to the Long Beach City Council, asking them to support the Carson plan in May. Garcia said a franchise or two moving to Carson, which sits less than 10 miles from downtown, could create an influx of tourism and retail business for Long Beach. The council voted unanimously to join in a resolution supporting the Carson project. Currently, there are three teams and two stadium sites vying for NFL approval for a SoCal relocation. The Raiders and San Diego Chargers have proposed to share the cost of the $1.7 billion stadium project in Carson, while St. Louis Rams owner Stan Kroenke has purchased the old Hollywood Park site in Inglewood and broken ground on construction for the $1.8 billion complex, where he hopes to relocate the Rams to. Both the Rams and the Raiders left Los Angeles after the 1994 season, and the city has been without a franchise since their departures. Up to two of those teams could move as early as next season, but would require either the Inglewood or Carson plans to garner 24 votes at the owner’s meeting in mid-January.